Now, with voice ascendant, and podcasting proving to be a breeding ground for new narratives that other storytelling mediums can latch onto — the move into the reinvention of radio for the 21st century seems prescient. It’s not just Fox that is now backing the podcast business; new investors led by storied venture capital and private equity investor Alan Patricof’s Greycroft Partners are coming aboard with a $5 million commitment to expand the scope of Wondery’s wonder factory. Additional investors include Lerer Hippeau Ventures and Advancit Capital — the investment vehicle for Shari Redstone (daughter of billionaire media mogul Sumner Redstone). Previous investors BAM Ventures, Watertower Ventures, Fox Networks Group and BDMI also participated in the round. According to The Hollywood Reporter, Wondery intends to add new shows to its stable, including American Innovations, Dr. Death and I, Survivor, and has optioned Sward and Scale and Tides of History as projects for movies and television. While traditional media companies are being forced to join forces and combine assets to protect their market from new competitors like Facebook, Apple, Amazon, Hulu and Netflix coming from the tech industry, new media platforms like podcasting are opening up opportunities for different kinds of studios to emerge. 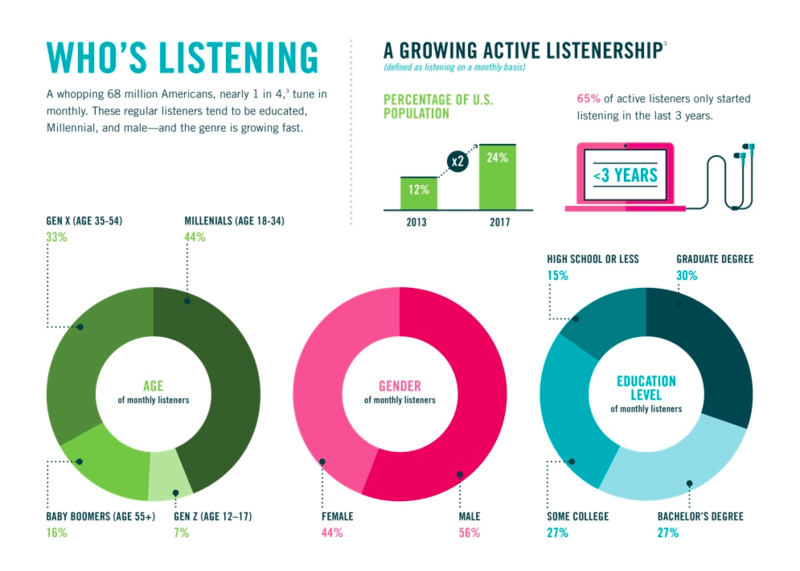 On average, the modern consumer listens to four hours of audio per day, according to Lopez. Even though most of that is music, an increasing number of Americans are turning to podcasts as a new form of entertainment. And podcasts are beginning to attract more advertising dollars. “In the podcast world the ads seem to work. They’re native, they’re integrated into the shows. The listeners are welcoming,” says Wondery’s chief executive. That in itself would be a welcome change for media companies hungry for new ways to maintain their ad-supported business models. Netflix, Amazon and Hulu have trained a generation of consumers on subscription models that eschew advertising altogether — but podcasts still hold out promise, says Lopez. Demographics are another key reason that advertisers are moving to podcasts, he says, and Comscore research (funded by Wondery) seems to back up his assertions. According to Comscore, nearly one in five Americans aged 18-49 said they’d listened to podcasts at least once a month — a number that increases when it’s restricted to the highly coveted demographic of men between the ages of 18 and 34, while nearly one in three men 18-34 do so. Podcast listeners are also more likely to have a college degree, make more than $100,000 and be early adopters of electronics, consumer goods and entertainment. Advertisers are beginning to take notice, with $119 million spent on podcast advertising in 2016 and an estimated $220 million spent on podcast ads last year (according to estimated figures in a survey underwritten by major podcast networks). Some of Wondery’s podcasts have already racked up impressive numbers. Dirty John has been dowloaded more than 20 million times; American History Tellers has been downloaded more than 3 million times; and Business Wars more than 2 million times, says Lopez. Wondery is also bucking the media trend of serving up micro-content to audiences. Lopez’s Wondery isn’t the only company to rake in money from institutional investors for building a podcasting empire. On the other side of the country in the borough of Brooklyn stands Gimlet Media, the $20 million king of the podcast market these days. Gimlet raised from a slew of investors, including WPP, Betaworks, Stripes Group, Lowercase Capital, LionTree Parters, Emerson Collective, Cross Culture Ventures and music manager turned investor Troy Carter. Wondery’s own “Dirty John” is being turned into a series for two networks — true crime stories on Oxygen and as the basis for a scripted series on Bravo. Meanwhile, “Welcome to Night Vale,” “Alice Isn’t Dead,” “Up and Vanished” and “Crimetown” are all being turned into series by different production companies. “In the last year or so, podcasts have been the thing,” Matt Tarses, the creator of “Alex, Inc.” (a new ABC show based off of Gimlet Media’s “Startup” podcast) told The New York Times.